Born from a thirst for singularity and the desire to disrupt a monopolized industry, Saint Owen overthrows the stereotypes of eyewear by combining brazen attitude and unrivaled quality. 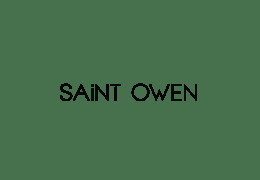 In the midst of faceless brands and mass production, Saint Owen offers intimacy and individuality. The designers and curators behind the brand, sisters Val Sanders and Michelle Haner, pull from their own musical background and experiences on the tour circuit to create a luxury brand with grit and authenticity.